It controls the transparency of a selected object. 100% is the default value, which means fully visible. At 0%, the object is completely invisible. It controls the color of a selected object. By clicking on the little color rectangle, the color picker will popup (more on this in the next chapter). Next to it, there’s an eyedropper icon. When clicked on, you will be able to pick a color from the entire Adobe XD’s canvas and interface. This color will become the new fill color of your selected object. It controls the border properties of a selected object. You can change the border color and its thickness. You can also pick an existing color with the eyedropper icon. It controls the shadow properties of a selected object. • By setting the x and y values, you will define where the shadow will be cast (left, right, top or bottom). • The B value controls the blur of the shadow. • You can also change the shadow’s color and opacity by using the color picker. With this option you can add a cool blur effect to a selected object, which is a technique often used in UI design, mostly applied to background images or as an overlay to entire sections of an app. 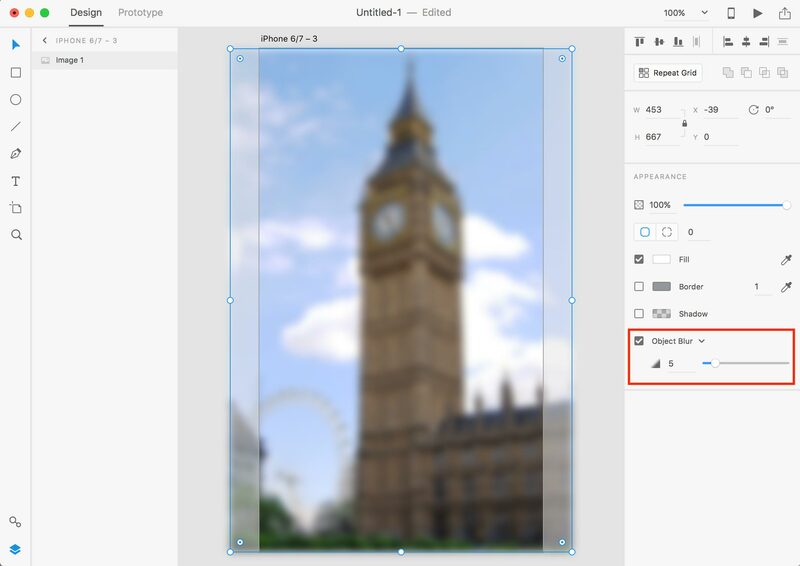 When you blur objects in Adobe XD, the changes you apply are non-destructive, meaning that you can always recover the original version of your object just by disabling the blur effect (this is not the case in other tools like Photoshop). This method is suitable if you want to blur a specific portion of an image or artboard. Use this method if you want to blur an entire object.